Why pay more than your share? Real Estate Tax Consulting Business Specializing in Property Tax Reduction Since 1987. Get a FREE property analysis. Assessment Valuation Services is a Minnesota based Real Estate Tax Consulting Business established in 1987. Our mission is to make every effort to ensure our clients pay only their fair share of property tax and to conduct ourselves with the highest integrity and professionalism, while meeting or exceeding our client’s expectations. Our sole focus is to pursue property tax reductions for our clients. AVS represents clients with multi-state interests, as well as, clients with property in one state. On an annual basis we review hundreds of commercial properties and pursue tax reductions when prudent. We handle all types of commercial property (apartments, office/warehouse, manufacturing, retail, hotel…). 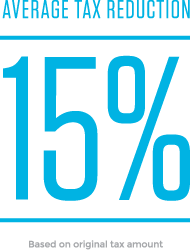 On a percentage basis, reductions achieved average approximately 15% of the original tax amount. We are proud to say that we have hundreds of satisfied clients. We are confident that we can meet or exceed your expectations. AVS stays abreast of the real estate market (property sales, vacancy factors, operating expenses, lease rates, cap rates, tax court cases, and state property tax statutes…) through research, professional contacts, professional associations and services. We have established professional working relationships with many of the assessing authorities throughout the areas served. We are a member of the Better Business Bureau serving Minnesota and North Dakota. AVS has an A+ rating by the Better Business Bureau of Minnesota and North Dakota. We care about our clients and the quality of service we provide. Not only because we’re professionals, but because strong, positive business relationships based on proven performance are key to our success. Compensation to AVS is based solely on our performance for you. We collect only a percentage of tax dollars saved. Why pay more than your fair share? Have your property analyzed today! AVS will do a thorough analysis of your property taxes. We will check your tax records for property classification, land area, building characteristics, and review the market value to ensure that the property tax burden is fair. Every effort will be made to understand the unique characteristics/circumstances of your property to establish a basis for reducing your tax burden. The taxing authority responsible for establishing a market value on your property could overlook unique characteristics and/or circumstances that have a direct effect on the value of your property, such as, excessive vacancies, functional or economic obsolescence. If it is determined that your market value is fair, no further action will be taken with regard to the current assessed market value. Future assessed market values may, however, still be in question. We will continue, at your request, to review new information, changing market conditions and future assessments, pertinent to your property. If it is determined that your market value is excessive, we will recommend that appropriate steps be taken to pursue a fair resolution. We will build a case, compiling data in a format that is acceptable to the assessing office that will clearly express the characteristics and circumstances that reflect our position with regard to your property’s value. We will engage in dialog with the assessing office through informal negotiation and/or by filing a property tax appeal. Once a settlement is reached, we will file the necessary paperwork to ensure the correct changes are made to your records, accurately reflecting the agreed upon settlement. If a favorable settlement cannot be reached we will discuss your options with you.